WILLEMSTAD - There is currently no dialysis center at the Advent Hospital at Damacor. The Public Health Inspectorate has taken action. The care and safety of patients are not in order. 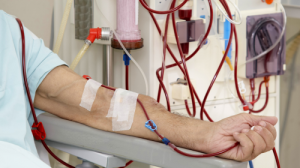 A dialysis center is for patients who have problems with their kidneys. In a recent interview, the health inspector Gersji Rodriguez explained that the center can open again only if they can guarantee the quality of their personnel and equipment. There must also be a cooperation agreement with the Saint Elizabeth Hospital (SEHOS) in case of problems at Advent.